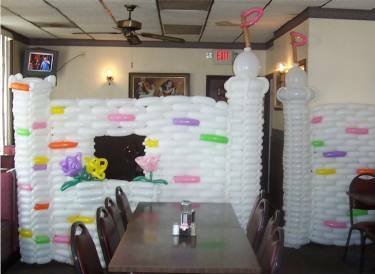 Description: Princess castle front - The castle was set up in one of the local restaurants to be the main attraction for a Princess Party. The party was held behind the walls. The window in the largest wall was designed so the princess and her subjects could have their photos taken "in" the castle. The far left turret stood almost 6' tall. A special thanks to my 2 assistants who helped inflate the balloons for me so that I could use my time for construction. Their help shaved hours and hours off the time needed to make the castle.